It’s hard to believe now, but when Donald Trump announced his candidacy for the presidency back in June, he reportedly had to pay people to attend. 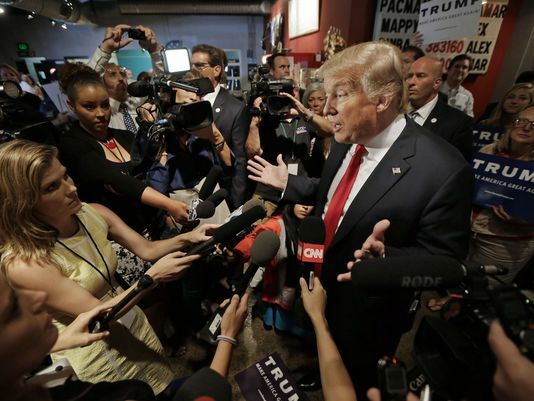 He has now grown to be the most popular Republican presidential contender, filling stadiums and drawing non-stop coverage with his headline-grabbing comments. How did this happen? And why now? While Trump has built a multitude of companies bearing his name – his greatest achievement may be in how he has trumped the media at its own game. The simple truth is that the more outrageous Trump is, the more everyone will cover him because his rantings translate into ratings – which in turn, translate into money. Unlike other candidates, he doesn’t even have to be on camera for an interview; FOX, CNN, NBC, et al., salivate at the chance to just talk to him on the phone, hoping for another shocking quote that they can play over and over again to keep viewers tuned in. Newspapers hope incessant coverage of “the Donald” will translate into on-line page views, which also translate into dollars. In short, everyone in media is getting rich from Donald Trump, even those who profess to loathe him. Many have referred to him as a clown but it has become pretty clear that Trump is the ringmaster and not the clown, cleverly stage-managing and calling the shots on the nightly news and within the party. Trump is making them money – and knows it. The CNN GOP debate was the network’s highest-rated program ever and it was mostly due to the beige-haired elephant standing center stage. Trump has become the Frankenstein monster of the GOP, stitched together with the extreme views of birthers, tea-partiers and frustrated voters. His messages resonate with the deep discontent, anger and polarization that exists in our country. Like the poor creature who Victor Frankenstein raised from the dead, Trump has broken out of the GOP lab and is now trampling the countryside, but instead of taking up pitchforks against him, people are flocking to hear him, impressed with his blunt talk and wild promises. The media now wrings its hands, claiming they are only covering Trump because he is making headlines, but they take no responsibility for creating him with their incessant money-driven coverage, they take no responsibility for conditioning the appetite of a public that is now gorging on political sugar, devoid of any substance. As for the GOP, they need Trump’s voters and his growing political power, so they are cagey about their criticism of him and for that he mocks them, laughing all the way to the bank. He gloats when he calls them out for their hypocrisy, pulling the dirty curtain back on how campaigns raise money in exchange for favors, bragging that he had candidates dancing like marionettes when they came to him for support. If the other candidates criticize him, Trump immediately responds with a castrating comment – showing what a dirty fighter he really is. For example, few know that Rand Paul wears hearing aids but Trump apparently does. When Paul criticized Trump’s position on healthcare during the first GOP debate, Trump responded by accusing Paul of not being able to hear what was being said. Take another look at that moment and you’ll see the pain flicker across Paul’s face as Trump’s gut-kicking salvo hits, marking a new low in personal political attacks. FOX news has long been Trump’s unofficial PR firm, but we’ve seen that when FOX news anchors offend him, Trump picks up the phone and calls CNN, which would break away from the second coming to go live with him. If they are too hard on him, the next call is to NBC. He shows up at news conferences and sneers at the journalists, insulting them with crude and condescending comments, belligerently pointing out how much money their employers are making by covering him in this ongoing dance of dollar driven dysfunction. Ka-ching, ka-ching, ka-ching…Say it again, Mr. Trump – a little louder this time, and can we have an exclusive on that? I have been hoping your prediction of the Trump media abandonment would come to pass, however in this election cycle, we are seeing that none of the conventional rules apply to this megalomaniac. Considering Howard Dean’s candidacy came to a screaching halt by a simple college howl, and Mike Dukakis ended his campaign by being a steam rolled by the press while hitching a ride in a Sherman tank, Trump has been the one candidate in American history who has proven the more outrageous he becomes, the more followers he attracts. At this point, my prior smug confident conviction that he is a completely unelectable candidate is evolving into serious concern that his movement could be unstoppable and he could become the American Hitler of the 21st century. I am learning to never doubt the collective ignorance of nationalistic pride in the American people, After all, we’ll do anything to make America Great Again, ANYTHING! Your insight into the media is very refreshing coming no doubt from your long years in the maw of the machine. The media will abandon Trump as fast as the picked him up. He’s playing brinksmanship and he will eventually utter something so contemptible that all the legitimate media will condemn and abandon him. Then all ne will have is the Fox echo chamber.